Last weekend, we had little William. We took him for a boat ride. This boat is called the Chautauqua Belle. Ever his grandpa's grandbaby, he was very interested in the paddle wheel and the motor. He asked to see them again and again. Very serious looking, isn't he? Steamboats are very serious business Grandma! Did you hear the man say that this is one of four steampowered paddlewheels left in the country? The nearly two hour trip took us up past Chautauqua Institution, where we saw Garrison Keillor just a few weeks back. The belltower. If you are well heeled, you can arrange for a young woman to play music on it, like perhaps Happy Birthday, or Christmas carols. The music floats across the lake. This is one of the mansions on the lake. It is supposedly haunted by the ghost of a little boy. His father was a wealthy business man who flew home on a seaplane at the end of a work week. The little boy came rushing out to meet his father, fell off the dock and was drowned. This is the Anthenaeum Hotel on the grounds of the Chautauqua Institute. It was a great trip, even though we ended up soaked to the skin, and a week later, William is still imitating the whistle. Thank you for sharing photographs from your boat ride. 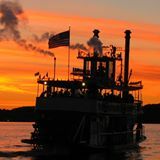 One day I will go for a ride on the Chautauqua Belle. I want to go for a ride but keep postponing the ride to another year. Hmmm... more Chautauqua. What a fun adventure for a little boy (and for big boys, too)! Thanks for getting that song in my head now. Luckily, it's one of my all-time favorite shows, so I can think of worse songs to have stuck.